Despite major shifts in the publishing world—including dramatic declines in print ad revenues and numerous closures of print publications—consumers still want to read print magazines: 92% say they plan to stick to print; and when given the choice of print, e-reader, or online delivery, 90% still prefer print, according to a survey from the CMO council. Just 17% of magazine readers surveyed prefer to read electronically, and 9% prefer some form of e-reader device. Among such readers, 24% say they intend to eventually switch over to an e-reader, whereas 67% say they want to physically hold their magazines, even though they acknowledge the e-reader has its place. 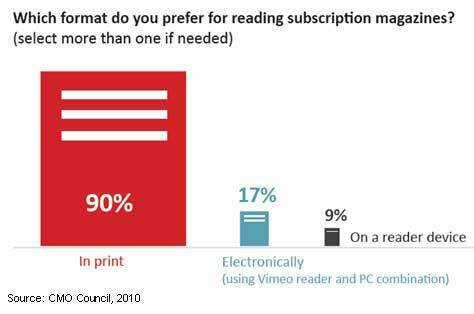 Some 9% already read magazines on an e-reader. Below, other findings from Leveraging Loyalty to Transform Publishing by the CMO Council, which examines the topic of relevance in publishing and advertising.